When Apple first released iBooks for OS X Mavericks back in 2013, I was really disappointed with the fact that iBooks app for Mac lost many features to organise my collection that previously could be done easily using iTunes. So I decided to get rid of iBooks for Mac, moved my e-books back to iTunes and write a guide about this. My post on iBooks became one of the most popular article in this website for quite a while. The following year, when Apple released OS X Yosemite, I posted an updated guide with steps to get our books back in iTunes on Yosemite. Again it became very popular post. This year, Apple released OS X El Capitan few months ago, I quickly tried to do the usual steps to remove iBooks app. It was successful. The app was removed. I checked iTunes, my books are there. Seemed good until I started to realise that I could not login to my Apple ID in iTunes. So I could not purchase anything in iTunes, or even download app updates. After some experiments and few minutes of googling, I discovered that the absence of iBooks app is the culprit behind this sign-in problem. iTunes needs something from iBooks app to be able to sign-in. The bad news: this time I could not find a way to make things work. I could not have my e-books in iTunes without breaking login functionality. Then I decided to have another look on iBooks app. 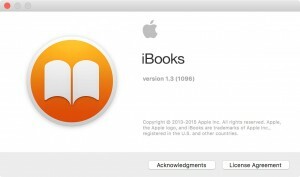 The last time I used iBooks for Mac was 2 years ago, version 1.0.1 (281). Maybe the app itself has evolved a bit over 2 years. So I checked the latest iBooks app for El Capitan, version 1.3 (1096), trying to have a second look objectively. To be honest, I still prefer iTunes in managing my books, but iBooks app 1.3 for Mac is not as bad as it used to be. I can do basic information editing for books that are not purchased from iBookstore now. The lack of this feature was one of my major disappointments 2 years ago. I also discovered that in El Capitan, iBooks app copied my books into its library instead of moving my ebook files. If anyone can find a way to move the books back to iTunes without breaking any functionality, please do let me know. Until obtain the know-how from someone else, I simply decided this is not worth my time. So, I finally decided to end my “war” against iBooks for Mac. I let iBooks stays in my Mac and handles my ebook library now. you can try on Virtual machine with WMWare Fusion to see how it works. Tried iBooks with my new MacBook 12″. Not sure if I have missed a recent update or what (I’ve been religiously following your tutorial to “get our books back”), but it seems that the new iBooks may finally give us all the functionality we’ve been missing. Can you confirm? I followed your guide for removing iBooks. Then I uninstalled iTunes 12.3.3 and installed iTunes 12.2.2. So far, I’m able to login to my Apple ID in iTunes. Glad that it works for you. I still choose not to do it though. I still like the idea of being able to update my iTunes as I please. Staying in older iTunes version will create problem when I’m getting new device later. I tried using iBooks in El Capitan but it would not ever sort the books correctly, so I reverted back using your original steps and did not have any problem logging into the iTunes store.